Do you know how to help your students learn to apologize? 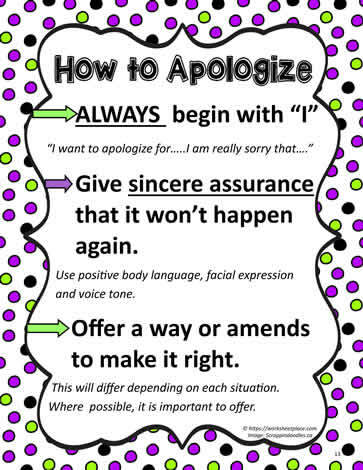 This poster is a helpful strategy for helping students learn to apologize. It is a 3 step process, start with an I statement - I am sorry and I would like to apologize, let them know it won't happen again, give them some assurance and then ask how you can make it up or ammend. This will be different for each situation.